Following the earlier post about sheep collars there was the mention of a food very specific to Shetland – reestit mutton. Here at WOVEMBER we like to celebrate everything the sheep has to offer and thought we should look a little further at this. Reestit mutton has been a home-killed and cured meat in Shetland for a great many years; this was a way of preserving food to last throughout the lean winter months. Originally mutton, but now commonly lamb, the meat is heavily salted in brine and then hung to dry. Traditionally the joint would have been placed in the rafters of the home and cured over the peat smoke of the fire. Once dry the meat – burgundy red, with pale fat – is cut up, brined and dried once more. When ready for consumption it is boiled in soup and the meat is also shredded and eaten on bannocks. It has a flavour far more intense than any roasted lamb and is, of course, very salty. We just got local lamb for our freezer and no doubt that the croft we got it from will be salting their own joints to be enjoyed from Christmas to New Year and through to Up Helly Aa in January (and beyond). While lamb is still cured and dried in this way, it can also be purchased from local butchers – the hard word done for us. Elizabeth Atia wrote very recently for A Taste of Shetland about reestit mutton and a little of it’s history in Shetland. Very kindly, Elizabeth has allowed WOVEMBER to share her soup recipe for anyone willing to try this hearty, traditional Shetland dish. 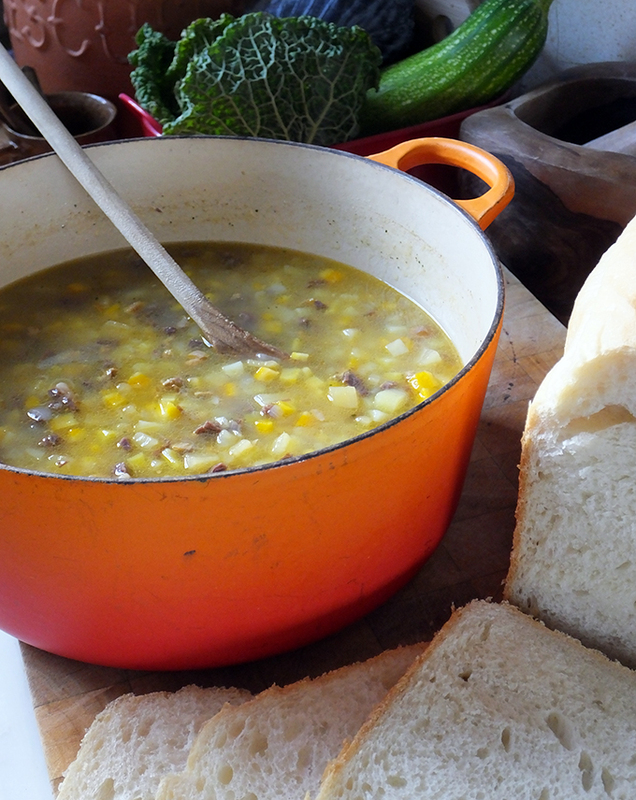 Reestit Mutton Soup: A traditional hearty Shetland soup recipe. Place the reestit mutton in a large pot and cover with cold water. Bring to the boil and continue to boil for almost two hours, or until tender. Remove the meat from the pan. Reserve a ladleful of the cooking water. Skim off the fat and add more water (or lamb stock) to your own taste. Add the chopped potatoes, carrots, turnip and onion and boil until tender, about 20 minutes. Mash the vegetables into smaller pieces, if desired, and add the reestit mutton, finely chopped for the last few minutes of cooking. Storage advice for unused reestit mutton: Store in a dry environment. Do not refrigerate. Alternatively, cut to your requirements and freeze. As well as contributing to A Taste of Shetland, Elizabeth Atia host’s the Elizabeth’s Kitchen Diary food blog – an amazing resource of recipes and her adventures in cookery. Thanks again to Elizabeth for sharing her recipe and photograph with WOVEMBER.